Blockchain digitizes shipments and the supply chain. One of the advantages of blockchain technology for businesses is that it offers more transparency about shipments and how products move through the supply chain. People cannot edit information once it gets entered into the digital ledger. Then, businesses don't have to worry about potential records tampering. Also, all relevant parties can track shipments in progress, assisting all members of the supply chain. In 2018, IBM and Maersk teamed up to make a blockchain platform for global trade. IBM notes global trade costs an estimated $1.8 trillion annually, and that the savings from more efficient processes could shave off about 10 percent of that. Also, an Israeli startup called LogChain recently completed its first international maritime shipment with end-to-end blockchain technology. That method reportedly reduced shipping costs by 7 to 9 percent and caused the necessary documentation time to only take a few minutes instead of the usual couple of weeks. That's due, in part, to LogChain's use of smart contracts that keep all supply chain members in the loop. These are only a couple of the many examples that show how blockchain could streamline supply chain shipments by digitizing them. Learning more from electronic medical records with help from AI. Hospitals around the world have transitioned to electronic medical records. One of the benefits they bring is the ability to look at a digital representation of a patient's medical history spanning beyond a particular facility. Recent work from Google involves getting even more value from digitized records by using deep learning, a subset of AI. Deep learning models can make broad predictions relevant to hospitalized patients. They reviewed patient data in a timeline format that showed each event occurring during a stay. Then, the algorithms used that information to predict things such as rates of inpatient mortality or hospital readmissions. AI didn't cause health record digitalization, but it opened up possibilities that could help providers improve patient care. Banks depending on blockchain for various applications. A 2017 survey of Americans' banking habits shows they prefer digital methods, with the majority choosing to bank via their computers, and mobile phone platforms ranking as the second most popular option. Considering bank branches and ATMs together, only a quarter of respondents in total chose one of those methods. As it turns out, banks are getting more digitized too, thanks to the blockchain. Emirates NBD, a bank in the United Arab Emirates, began using blockchain technology last year to minimize check fraud. Every page in a newly issued checkbook from the bank has a QR code that registers the check on the blockchain. Each check gets cleared through the bank's image-based check clearing system, and bank employees can see every step of the process due to the blockchain registration. In its first month of using the blockchain system, the bank reportedly registered nearly a million checks on the blockchain. In another example still in the preliminary stages, the largest Japanese bank wants to unveil a blockchain-based payments system in 2020. It says the platform will process more than a million transactions per second. There are other, broader blockchain banking trends, too. Some possibilities have not yet come to fruition, but they highlight the potential that exists for helping the banking sector thrive in a more digitized world. AI and blockchain used for more current business contracts. Even the best intentions in the business world typically don't get very far without signed contracts. When businesses create contracts, they may do so for transactions that could occur weeks, months or years later. But, the business world moves so fast that those contracts could quickly become outdated. However, people anticipate a time soon when AI and blockchain work together to give real-time updated contracts. Blockchain already handles self-executing "smart contracts." 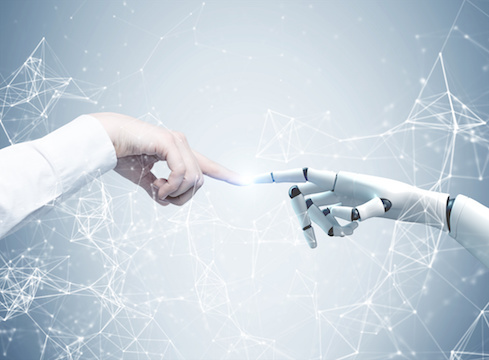 AI could come into the picture if parts of those contracts dictate the fixed terms, as well as aspects that might change automatically as conditions in the business environment do. Another possibility is that AI could analyze past negotiations made by involved parties and determine the likely outcomes of current business efforts based on past decisions. This pairing of the two technologies is in its infancy. But, people should stay tuned to see what develops. Music distribution improvements with help from AI and blockchain technologies. Many analysts believe streaming media platforms saved the ailing music industry. Thanks to services like Napster and Limewire, people got used to downloading tunes for free, making record labels suffer. Streaming made people accustomed to paying for music again, but many enthusiasts — as well as artists — remain in the dark about the associated distribution and payment models. A few pioneering companies want to change that. One is a smart speaker brand called Volareo. It uses AI to do many of the same things the more well-known smart speakers achieve, such as respond to voice commands and play the songs people ask to hear. One definitive difference about it is the speaker lets people support artists through cryptocurrency payments. People can reward artists they like, and establish stronger bonds with them. MusicLife is another new company that combines AI and blockchain. It uses AI to calculate the fair value of songs based on how many people listen to them. As such, people directly invest in their favorite artists. They can also buy a cryptocurrency that supports an incubation program for new artists. Artists license the copyright to MusicLife for distribution, but retain 95 percent of the ownership rights for their songs. AI and blockchain streamline online shopping. Online shopping is going through a revolution due to technologies like chatbots and augmented reality. It's not surprising that there are applications for AI and blockchain to change e-commerce, too. A platform called Eligma uses both to alter how people discover things to buy, shop for what they want, track shipments and even resell items. One part of the business strategy is to allow people to pay for their purchases in cryptocurrencies even if the stores don't support them yet. A blockchain system built with Ethereum uses smart contracts and helps people safely engage with sellers or potential buyers. Also, AI reveals products with the best quality/price ratio and even recommends the best times for sellers to put their products on the market. The hope is that when people can use a single platform for so many e-commerce needs, they'll buy and sell more efficiently. The fact that it's not possible to change information after it gets entered on the blockchain could also make it easier for stores to verify purchases and process returns. This list shows how, both by themselves and together, AI and the blockchain support the transition to a more digitized society. It'll be fascinating to see how things continue to unfold.